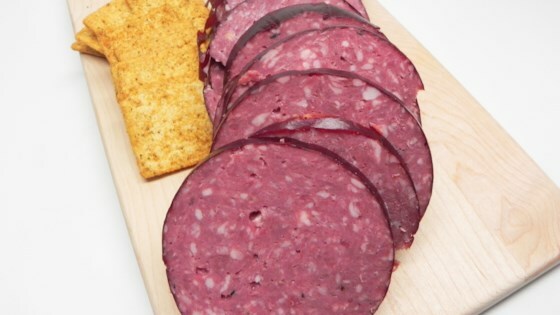 "This is a ground beef summer sausage you can make at home. It takes a while, but have you seen the prices of store bought summer sausage?! This recipe is well worth the wait. You can also wrap them in foil and freeze them." In a large bowl, combine the beef, meat tenderizer, cayenne pepper, ground black pepper, garlic powder, brown sugar, mustard powder and peppercorns and mix well. Pour the liquid smoke over the mixture, but do not mix. Cover and place in the refrigerator for at least 24 hours. Preheat oven to 150 degrees F (65 degrees C). Remove the beef mixture from refrigerator and mix well. Roll into 1 1/2x9 inch logs and place in a 9x13 inch baking dish. Bake at 150 degrees F (65 degrees C) for 4 hours. Remove from oven and let cool. Wasn't too bad. Didn't turn out like I expected and it seemed rather greasy. Mu sister in-law makes this every Christmas, she cooks it at 250 for 2 hours and shapes the logs and lets it sit overnight - it is awesome and turns out quite well.